Style Transfer Part 2: Face Swap! In the previous article we looked at what style transfer was and how to use it to create your own art. Now, we will focus on how to extend the capabilities of style transfer beyond the art realm. Please jump to the resources section of this post to find out about the code used to generate the examples. Figure 1. Face swap using Gatys et al. method. As you can see, the result is kind of a disaster. The output does not look at all like a face transfer from Jim to Gollum. On the contrary, it's just Jim's face with an annoying white texture and shades of brown and gray. Seeing this result, a couple of questions arise. First of all, why did this happen? Second, how can we fix it? In this article, we will guide you through the answer to both questions. We will pinpoint the limitations in Gatys et al. work and discover new techniques that improve the performance in tasks like face transfer. It is undeniable that Gatys et al. work on style transfer using deep neural nets was a pioneer. And, like all pioneer work, it's full of room for improvements. One aspect in which we could improve the original work is in the texture estimator. Recall from the first article that the authors propose it to be based on the Gram matrix. Figure 2. Gram matrix approach. The Gram matrix approach is great for artistic purposes, but it suffers when we want to have some control over which textures are transferred to each part of the result. The reason behind this is it destroys the semantics of the style image, only preserving the basic texture components. 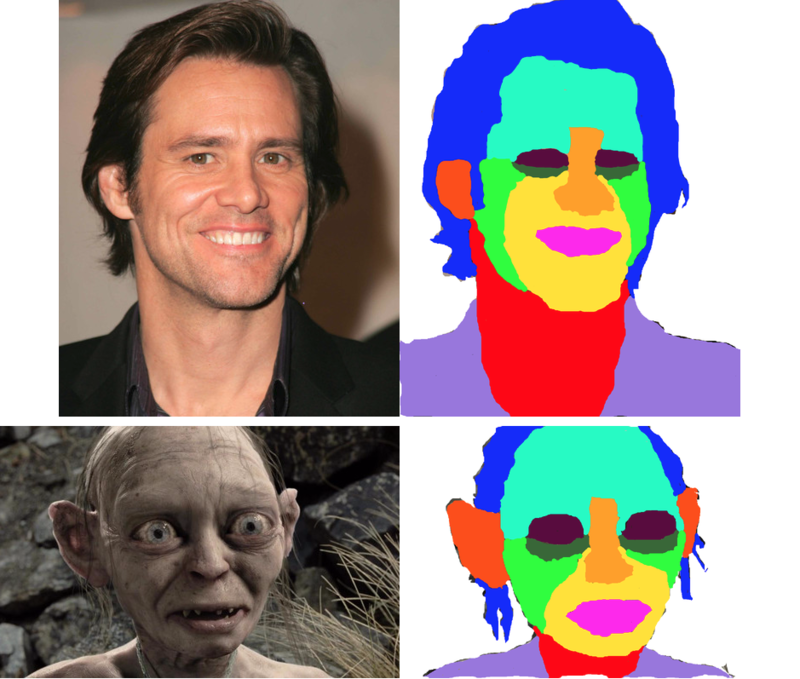 So we cannot, for example, transfer Gollum's nose style Carrey's one because the texture estimator has destroyed the hair information. We only have access to a global texture of the Morgan picture. 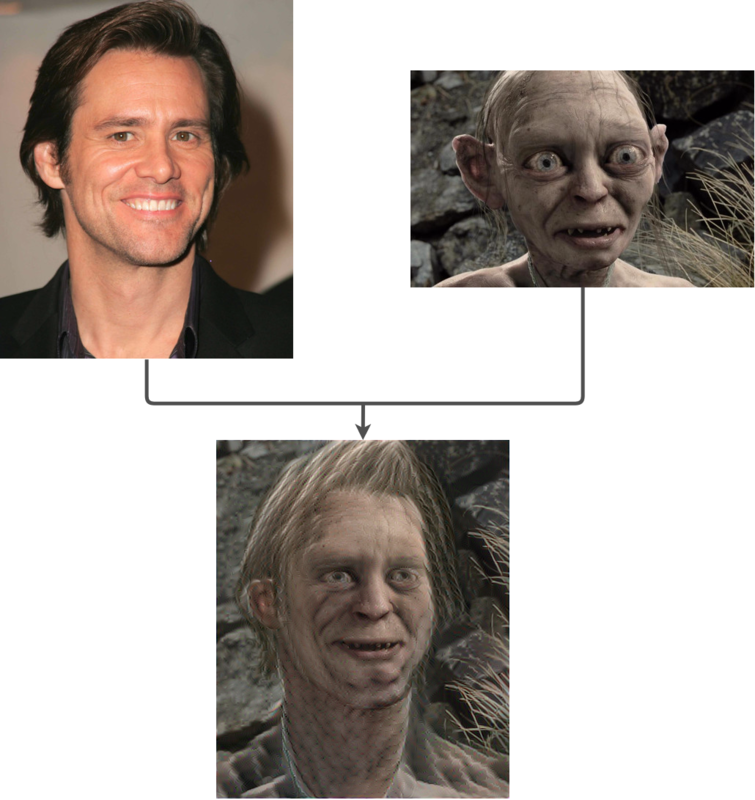 The global texture of the result is also close to the global texture of Gollum's image. 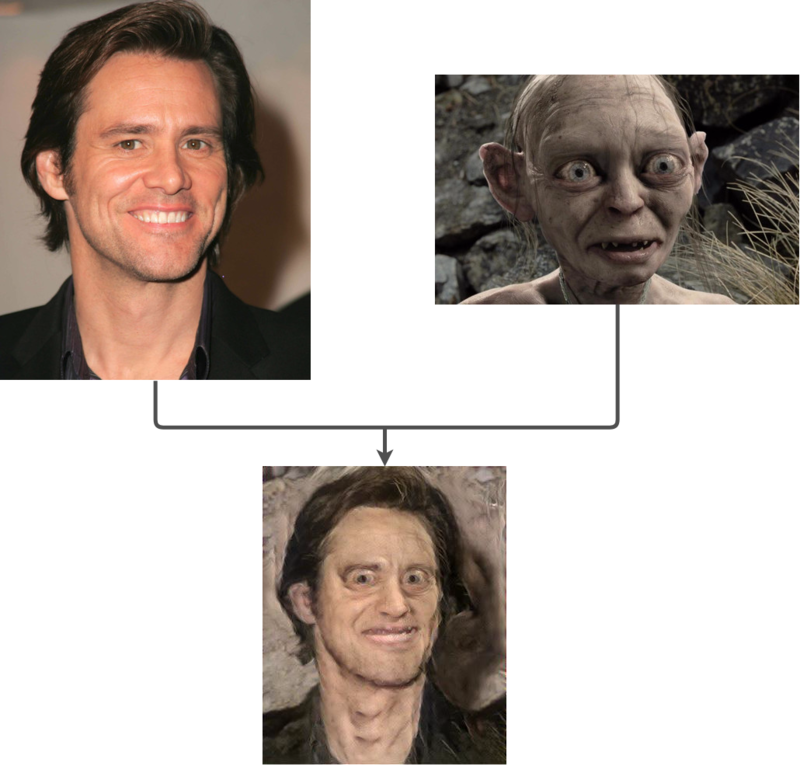 After all, the resulting face has a skin tone more similar to Gollum than the original Jim picture. So we were able to pinpoint the problem right to the texture extractor. Now we need to know how to improve it, in order to make face transfer possible. We will make two improvements. The first is based on Li and Wand Combining Markov Random Fields and Convolutional Neural Networks for Image Synthesis paper. The second improvement is based on Alex Champandard's Semantic Style Transfer and Turning Two-Bit Doodles into Fine Artwork paper. Li and Wand main contribution is spotting the limitations of the original texture extractor and propose a new one, based on Markov Random Fields (MRFs). For those not acquainted with the term, MRF is a probabilistic graphical model very used in image problems. In fact, it is considered a classic framework in image synthesis problems. Use the texture of this style patch on the resulting patch. Observe that the texture transfer is occurring locally, patch by patch until the result is finished. We switched from the global Gram matrix texture transfer to the local patch MRF texture transfer. Regarding the mathematical formulation of the problem, the content extractor and the merging procedure by optimization remain the same. The only differences are the change in the style extractor and a prior term that is not that important to know. Figure 3. Results obtained using Li and Wand proposed technique. As you can see, the result is much better than our previous attempt. Now we have a proper face transfer, thanks to the new local texture extractor. Nevertheless, the result is not great yet. 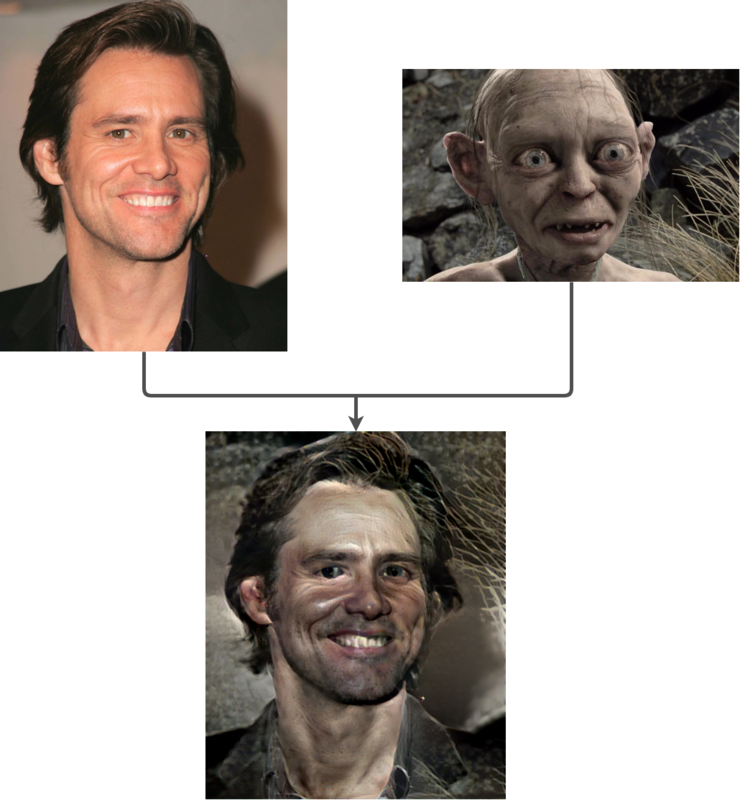 The picture has several artifacts, most of them take the form of the background of Gollum's image into Jim Carrey's hair. The main reason behind this is patch mismatch, something that is quite difficult to control in the current method. Remember when we were looking for the best patch to match the chin of the resulting image? It would probably be Gollum's chin. However, due to differences in the images perspectives, the algorithm could select another part of the image as the best matching patch. For improving our result, we could fine tune the optimization parameters and the size of the patches. This is definitely a way to go. Another option, which is more interesting for face transfer, would be using the method presented in Champandard paper. As we are going to see in the next section, this new approach improves the MRF suggestion of Li and Wand in a way that is ideal for our purpose. Our last improvement is based on Champandard paper. The author main contribution is augmenting Li and Wand method to allow the user to control where each style transfer will occur. As it turns out, this is enough to solve the problem with patch mismatch. Figure 4. Manually created semantic maps for the source images. In the example, we can see a couple of semantic maps colored by hand, where ten features were encoded using different colors. The idea behind the semantic map is to narrow down the space in which the algorithm looks for a patch match. For instance, if it is searching for the best mouth patch, it will put much more weight in the mouth patches of the style image. This way, it will be very unlikely that a patch mismatch occurs. There is no doubt this is the best result we have seen so far. The output face looks like a face transfer from Jim Carrey into Gollum. Now that we have a good method to perform face transfer, let's see how it works in practice. To our luck, Champandard has shared the code for his paper on github. Just clone the repo, follow the installation guidelines or use the docker container and you're ready to go. Remember from the previous article that you must have a good GPU to be able to run it in a reasonable amount of time. Also, make sure you are using the recommended Theano and Lasagne versions. Lastly, I would strongly recommend not to use CuDNN v5. The recommended way to go is to use the virtual environment provided in the GitHub repo. To obtain the best transfer face, make sure that the content-weight/style-weight ratio is in the interval [0.6, 1]. To run your own face transfer projects, clone Champandard repo GitHub, follow the installation guidelines or open the docker container, create your semantic maps and make sure that the parameters are properly set. As a suggestion for improvement, one could try to add to Champandard approach an algorithm to generate semantic maps automatically from the original images. Below some further resources and the source code used to create the examples. Special thanks to the respective authors of the referenced code for the clarity in the implementation and wonderfully detailed readme's which makes it really easy to reproduce. 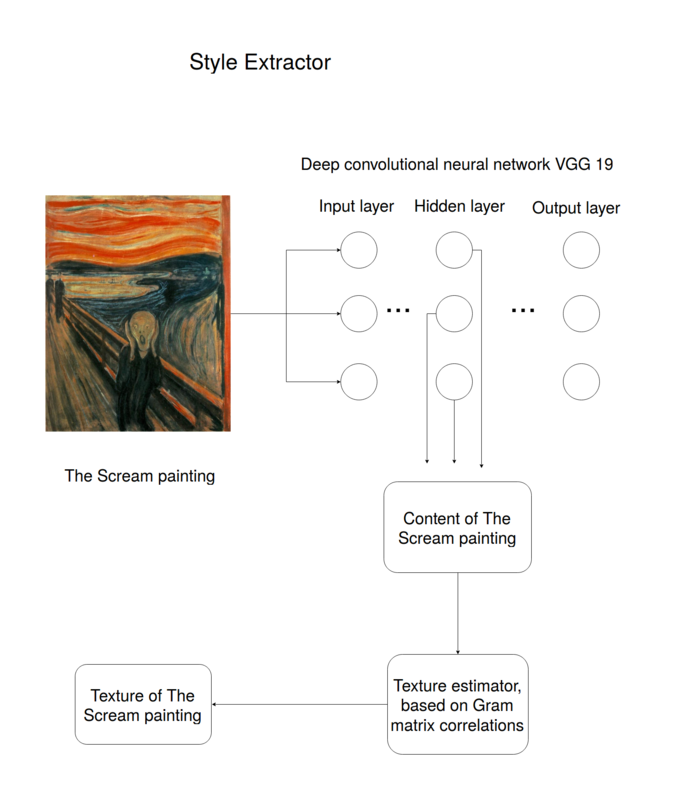 Creating art with deep neural networks. First post of the series. To get started with your own ML-in-a-box setup, sign up here. 1. Create a Paperspace GPU machine You can choose any of our GPU types (GPU+/P5000/P6000). For this tutorial we are just going to pick the default Ubuntu 16.04 base template.